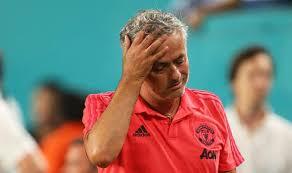 It has been a bad season for man united as they keep on depreciating in the league table after the 3-2 defeat by Brighton Manchester United lead by the manager Jose Mourinho was hoping to bounce back by beating Tottenham Hotspur but the reverse is the case as Tottenham beat Manchester United 3 goals to nothing at Old Trafford yesterday. Mourinho said as he walked out of the news conference "I won more Premierships alone than the other 19 managers together," Mourinho said. "Three for me and two for them. The World Cup highest goal scorer Harry Kane scored the opening goal of the Spurs in the 50th minutes of the game, Lucas Moura scored the second goal in 52nd minutes and the finishing goal of the Spurs in the 84th minutes, it was a day Tottenham Hotspur will never forget as they continue to stay on top of the table behind Liverpool. Manchester United will meet Burnley on Sunday 2nd of August while Tottenham will meet Watford on the same day, Tottenham and Watford meeting will be a great match as but teams has played unbeaten in their three past matches.